AIGA, the professional association for design, is the place design professionals turn to first to exchange ideas and information, participate in critical analysis and research and advance education and ethical practice. AIGA's mission is to advance designing as a professional craft, strategic tool and vital cultural force. AIGA was founded in 1914 as the "American Institute of Graphic Arts." Atomic Design is an integrated marketing firm providing exceptional graphic design, development, and marketing solutions. An essential partner to any business in need of market presence or seeking new concepts to energize and reinvigorate old brands. Firm offers a full array of graphic design services, consulting and solutions. Their experience in design has enriched many company identities. Projects completed recently include Fun with Frits, Satinwood Ltd, Atlas, Rockefeller Center, American Craft Magazine and many more. See photos of the firm's designs for USNWC signage. 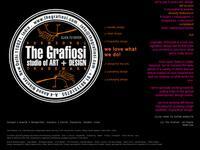 Graphic design services in New York City. A Delhi India based graphic design company with expertise in branding, corporate identity, book design, logos, fashion, website design, packaging, magazine design, fine art and photography. The firm has clients in London, New York and India. They find the ordinary, the discarded and the unusual exciting and inspiring. Offering web design, web development, web programming, e-commerce etc. RustyBrick is a New York web construction firm specializing in customized technology that helps companies decrease costs and increase sales. The company has a vision with proven processes and technologies. Web site design and development services at its Best. AIGA NY The Professional Association for Design, 164 Fifth Avenue, New York, NY 10010. Phone 212-255-4004. The AIGA New York Chapter is run by a volunteer board which is selected from the membership at large. Element Graphic Design, an independent graphic design company located in the New York, NY area provides graphic and web site design inlcuding brochures, catalogs, corporate identity and logo design, publication design, newsletters design and invitation design. A national union of illustrators, designers, web creators, production artists, surface designers and other creatives who have come together to pursue common goals, share their experience, raise industry standards, and improve the ability of visual creators to achieve satisfying and rewarding careers.